The inherent problem with the overwhelming majority of computer speakers is that they're almost always dreadful. They look pretty, but they sound awful. And that's how it's been for a long time now. This trend became more pronounced over the last 10 years, with manufacturers and designers alike putting too much emphasis on style, and not enough on substance. For too long, PC gamers were written off as undiscerning when it comes to sound quality. And Creative would be the first to admit that it was one of the companies that adhered to that philosophy. But with the Creative Gigaworks T3, all is forgiven. Because what we have here is an 80W 2.1 system that not only looks great, but sounds brilliant too. The Gigaworks T3's were born because Creative was no longer happy to churn out speaker products which were simply 'quite good'. It gave a budget to its audiophile engineers and instructed them to build something brilliant. The goal was to create an affordable 2.1 system that would deliver industry-defining audio fidelity. And the T3's certainly are that. We first met the T3's at IFA in Berlin back in August 2008. And inside Creative's sound proofed demo room were the T3's and a pair of very similar-looking speakers from Bose - the Bose Companion 3 MkII Multimedia Speakers to be exact, which cost about twice as much as this Creative set. The side-by-side tests showed a startling level of audio clarity in the T3's - whereas the Bose set sounded muffled in comparison. When we got the T3's into our own testing room, we reproduced this test and discovered identical results. We also tested them against the Aego M 2.1 speakers from Acoustic Energy. A 90W system which we gave 4.5 stars last year. AE is a full-blown Hi-Fi company, so we weren't expecting the T3's to beat the Aego M's, but as it turns out, the T3's won hands-down. We even kidnapped a number of people from our sister magazines and asked them to do a blind (deaf?) test. The T3's were the overwhelming favourites. And that's because the smooth, bassy audio that comes from these speakers literally drips with clarity. Crisp highs and deep lows are reproduced with such accuracy we almost couldn't believe our ears. This is just a £160 set of PC speakers remember. One of the secret weapons in the T3's arsenal is the Creative SLAM subwoofer (it stands for Symmetrically Loaded Acoustic Module) which uses three separate 6.5-inch drivers to combine precision and accuracy with deep bass. The two satellites are no slouches either. Symbols and acoustic guitar are reproduced with impressive lucidity, and backed up by creamy bass from the SLAM sub. The system also comes with a wired remote which includes a low friction volume dial which doubles as a power/standby switch. It includes the standard aux-in and headphone jacks as you'd expect. It's important to keep things in perspective though - this is by no means a high-end Hi-Fi system. Strap a pair of KEFs to a Naime amp and you'd immediately dismiss the Gigaworks T3's as amateur wannabes. 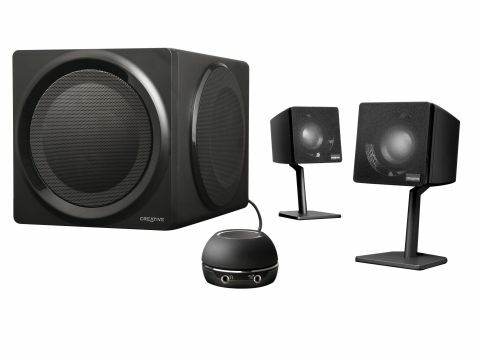 But as a set of PC speakers, ideal for listening to music, watching movies and playing games, they're very, very good. If money is no object, you'd probably still have to choose the quite brilliant THX-certified Razer Mako speakers. But they cost over £100 more than the T3's, and come with a number of drawbacks that the Creative ones just don't have. The T3's then, with their blend of value for money and startling quality, are the people's choice.